8th March – 13th May 2019 – Information sessions are live on eventbrite. 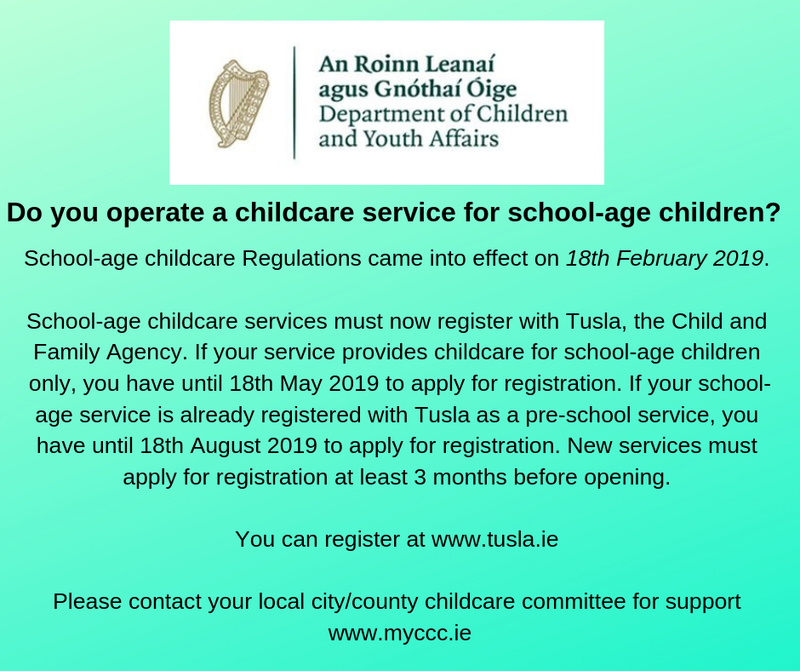 These sessions are for all providers, even if you are an ECCE only provider, it will benefit you to hear about the new scheme and the new online platform. Please see attached information booklets on the new scheme. DCYA have issued their latest news bulletin with information updates for you from across the Early Years Division at DCYA. The closing date for applications for Level 7 has been extended until today Friday 29th March 2019 at 5pm. This is possibly the last year this course will be offered over one year. This Bachelor of Arts in Applied Early Childhood Education and Care programme which is part funded by MBE Skillnet and is designed for those who hold a FULL QQI Level 6 major award in childcare and who are working full-time in the sector with at least 3 years’ full time experience. Please email info@wccc.ie or phone 0404 64455 or elaina.oflaherty@itcarlow.ie phone 0404 67125 for more information. 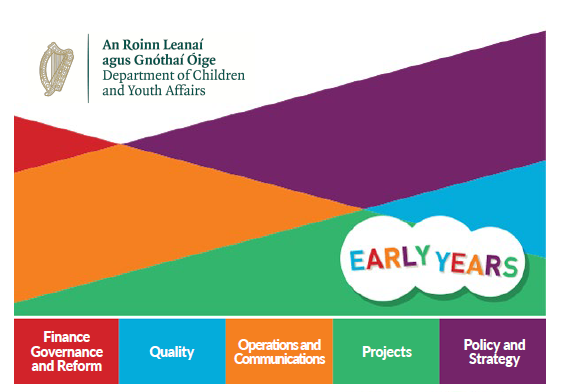 On Tuesday 5th March, Minister Zappone announced up to 1,150 free places on the Leadership for Inclusion in the Early Years (LINC) Higher Education Programme. Training will be held in Bray commencing September 2019. This is the last year of the LINC programme. More information on the programme can be found on www.lincprogramme.ie. 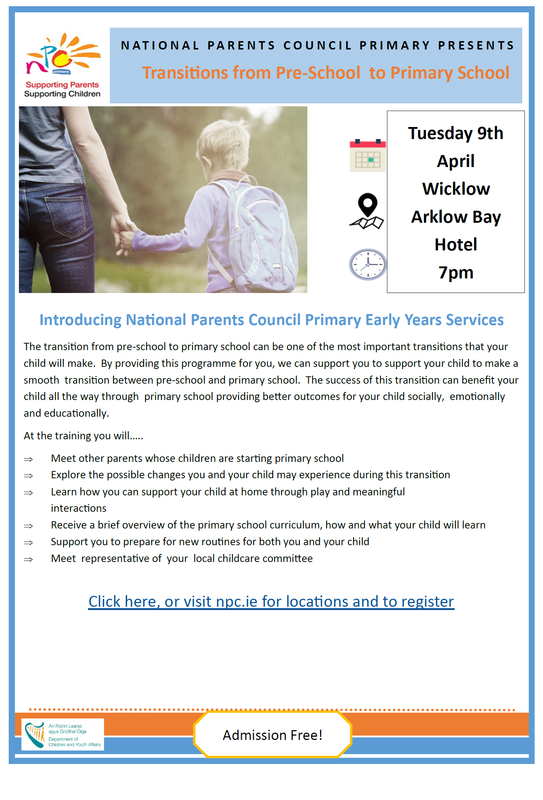 The National Parents Council will be running sessions for parents around the country to support them to support their children make the transition from pre-school to primary school. These sessions will also support parents of children who may have special educational needs. You can book a place via link below or contact cdowney@npc.ie or at 01 8874484.